Casa Kitchen Macaroon Kit - BRAND NEW IN BOX - FREE DELIVERY!! The kit includes a brown silicone macaroon mat (48 shallow moulds on mat), brown silicone Decomax and 4 nozzles (this is used to "pipe" the macaroon mix onto the mat) and a stopper for the Decomax also. Silicone 12 x Large Fairy Cake or Muffin Mould. TWO Silicone Round Sponge Cake Tin /Moulds. Use for cakes, bread, puddings, pies, and much more. This will be done asap but within 24 hours. 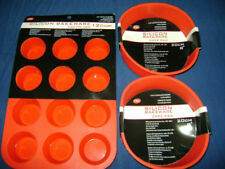 This is a 3 piece set of Silicone Bakeware! This Mould is designed to make 3 shapes of cookies or maamoul. 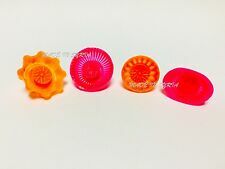 1 x Plastic Maamoul Mould. You can take the flour on the mold on the point of filling on the molding, but also with tricks. We will try our best to reduce the risk of the custom duties. Multi-purpose Oven Tray - ideal for roasting and baking - 42cm x 27cm x 2.5cm H. (including handles). Can I use Lakeland gift vouchers?. The rolled edges found on most bakeware introduce a difficult-to-dry space underneath the rim, and the edges themselves can be difficult to coat. Rectangular cake baking tin with slicer and cooling stand. When the cake is done, take the slicer out to reveal perfectly portioned slices of cake! Put the slicer into the tray and put the tray into the oven. Every essential piece in one premium bundle: roasting pan, square cake tin, loaf tin, muffin tray, two baking trays and a cooling rack. Baking and Roasting Tin Set. Roasting Tin - L-40.5cm x W-29cm x H-8cm. Tala alphabet and numbers stencils set upper case and numbers. Tala Alphabet and Numbers Stencils set, is from their quality cake decoration range. Crisper Tray Set Non Stick Cookie Sheet Tray Air Fry Pan Grill Basket Oven Dishwasher Safe Oil Free. And featuring dishwasher safe, you can clean the both parts into the dish washer or wipe them with cloth. New maamoul / cookies mould. For any enquiry please contact me via eBay message. Thanks. Get creative in the kitchen and bake delicious treats with this Salter baking tray and two cooling racks. Made from carbon steel, the tray has a non stick, grey marble coating, suitable for all manners of baking. This Kitchencraft Masterclass bakeware set includes and does everything. With an ingenious space saving design that allows the seven pieces to stack together to maximise the space in cupboards. Each component features a durable non-stick coating for flawless food release and quick and easy cleaning. The BKC Banneton proofing basket works by creating a slightly humid micro-climate between the dough and the Banneton during the proving process. Your dough will rise and create a stunning skin ready for baking. MULTI PURPOSE BAKING MAT – Our siliconbaking mats can be used for many cooking or baking task including; as a cookingmat, cookie baking tray, cookies rolling tray, baking tray liner, sheet pans for baking or pastry making and much more. A perfect addition to your kitchen, this set includes a baking tray, 6 cup muffin tray, springform tin and two cooling racks. Get creative in the kitchen and bake delicious treats with this Salter bakeware set. It is composed of fiberglass and is coated on both sides with non-stick silicone, allowing for the dough to be rolled out effortlessly. Used in conventional or microwave ovens for baking. They're also easy to clean--simply wipe them off using hot water and dish soap. One rectangular baking tray. Hell's Kitchen range. five-piece bakeware set in black silicone. Set comprises of: a six cup muffin tray. Easy to release food and easy to clean. one round flan/pie dish. Loaf Pan cooks a 21 x 11cm loaf (8.26 x 4.33"). 1 Purple Silicone 12-Mould Muffin and Cupcake Pan. 1 Purple Silicone Loaf Pan. The whole pan is 35 x 25 x 3cm (13.77 x 9.84 x 1.18"). They are also microwave-safe, so they're great for storing and warming up anything you might bake too! Crisper Tray Set Non Stick Cookie Sheet Tray Air Fry Pan Grill Basket Oven Dishwasher Safe Oil Free. Adopting premium iron material and high-grade resin coated on its surface, our crisper tray set (including a cookie sheet tray and a grill basket) is sturdy and non-stick. 6PCS/ 1Bag. Stainless Steel. hope you can understanding, will be sincerely appreciated. We will be glad to reply and help you to solve any problem. Color: as picture. Oval Bread Prover With Lining. Condition is New. Dispatched with Royal Mail 2nd Class. Each tin is hand dipped and hand painted for that rustic edge. Dishes are not suitable for dishwasher, microwave, freezer or hob top use. Roasting Tins. Frying Pans. Cake Pans & Tins. Baking Sheets. This Mason Cash 5 Piece Ovenware Set is made from quality stoneware which features beautiful black colours. This ovenware set can be used in all types of ovens - conventional ovens, gas ovens, electric ovens and microwave ovens and is dishwasher and detergent safe, ensuring practicality is always at the forefront. Hope you can understanding, will be sincerely appreciated. We will be glad to reply and help you to solve any problem. Color: as picture. We will be glad to reply and help you to solve any problems.